Noted Voice of America reporter, Dan Robinson, retired on Friday, February 28, 2014 after 35 years of service to the international broadcaster and listeners around the world. Many of us are fortunate to know Dan: not only is he highly respected as a correspondent, but he is also an avid shortwave listener and DXer. 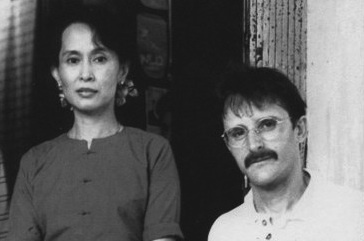 Dan Robinson with Aung San Suu Kyi. Former members of the Broadcasting Board of Governors (BBG), Ambassador Victor Ashe and Ms. Blanquita Cullum, noted his retirement as “a loss” to the agency. I encourage you to read the full report on BBG Watch. I’ve just learned that Dan Robinson will be the keynote speaker at the Winter SWL Fest this week. Best wishes moving forward, Dan! I know you’ll continue to have meaningful impact through your future ventures. This entry was posted in Current Events, International Broadcasting, News, Shortwave Radio, SWLers and tagged BBG, BBG Watch, Dan Robinson, Dan Robinson Retirement VOA, Dan Robinson VOA, Dan Robinson Voice of America, VOA, Voice of America on March 9, 2014 by Thomas. I am trying to reach Dan Robinson. I exchanged messages with him after I published an article about issues at VOA, but I lost that connection when I left GLV and I am trying to reconnect with him. If anyone here can reach Dan, ask him to go to http://www.bindlesnitch.com and leave me a message there so that I can reach him.